Just tried the Amy elite texture set, 1000 absorption and 100 scatter. 18,75,112 absorption and 189,148,127 scatter. Just did the face texture so you can see the difference to the original textures. Very nice, Michael! You can actually see all of her freckles. Just curious, what are your bump settings? It looks to be really good here and I know Lux can tend to really do a number on bumps. Thanks Slosh, going to expand on this one I think. The bump is very very low at 0.0006. Since Amy seems to be the girl of choice lately (in other threads, too), I thought I would try my recipe on her. The experiments I have been doing the last couple of days seem to really be on the mark, but I wanted to try it on a few textures before sharing. This is the 3rd attempt, and all have been very good in my opinion. Also notice, the eyes look pretty good. I think I have finally gotten a good formula for those as well, using glossy with no geoshell. I will share those settings later tonight. Gotta go pick up my pizza right now. Edit: Added Bree render, too. I second your opinion. Nice work! 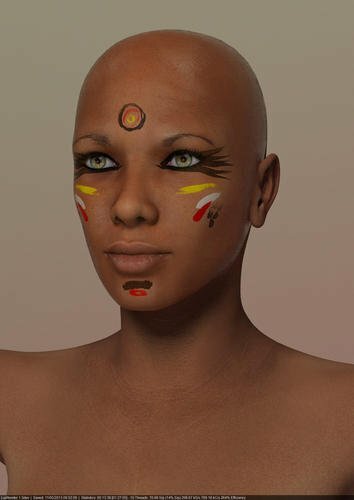 Tyneshe for V4, face texture only again, feedback pls? the eyes are bad I know. Face texture only? So I take it to mean you didn't apply any settings to the body? It looks that way. Feedback: I had to pull up the full pic to really see what was going on (I keep forgetting I can do that). I think, at full size, it looks really good. The top of her head and her jawline really have a nice glow/shine to them that looks very natural. The bump seems to be right on track, very Goldilocks (just right). The only thing that is bothering me is her nose and the cheeks just to the side of the nose. They don't seem to have the same sheen as the rest, but that may be due to the specularity map provided (assuming you used one). Just for S&G, have you done a render without specularity maps, using 1.45 as a skin IOR? If the IOR and the spec color and roughness are set right, there is no real need for a spec map. I like to test my specularity and roughness without maps first, then apply the maps if things are still too much. Her lips look really, really good. I struggle myself with getting the lips to look bumpy enough, but not overdone, so that they shine properly. You seem to have done really well in that department. Her ears are lacking as well, but now that I think of it, they are part of the torso texture set, which you say is not included here. I am writing some specifications on eyes right now, just waiting for my picture to render. I will be posting the settings as a journal entry on dA later today, as well as in this thread, even though it's not a skin setting. Maybe an eye thread is needed? Thanks Slosh, I did literately only her face texture hence the reason her nose looks off. I will try it with out a spec map later. Attached are screenshots for the Luxus material settings for the glossy eyes in my fairy picture. First is the standard glass material for the cornea and tear. I set the refractive index to 1.48, which is the average IOR for the human cornea. I tried it with 1.33 (water) as well. Either will work nicely, but the 1.48 matches better with the settings I will use for the sclera. The next section pertains to the Iris, the Pupil, and the Lacrimal. I included the lacrimal in these settings because they should not have the same settings as the face. They are wetter, just as the eye surface itself, so they need more gloss. I use a standard glossy material here, with a dark gray in the Absorption Color channel. This gives a translucency to the iris and pupil. I use a dark color because the absorption channel has an inverse effect. If I used a lighter color, it would actually darken the eye. This channel is also a good place to tint your iris if you want to slightly change the color provided by the texture. You could tint the Diffuse Color, but that often leads to loss in detail of the original texture. In some cases, where the texture artist has over-colored the iris, you may want to add a tint to both channels. Just remember to choose something that counteracts the offending color. I will explain this more specifically in the next section where I talk about the sclera. The sclera, in this particular example, was a very bright white. To tone that down and allow the specular reflections to show properly, I used a darker gray in the diffuse channel than that of the iris and lacrimal. If I had used a brighter gray, the sclera would have looked blown out, and the specular reflections would be hard to see. By darkening the sclera a bit, it gives a more natural look. The absorption color is set to a dark gray as well because there is no color tint to the sclera that looks bad. I use absorption color because our eyeballs do absorb some of the light. This keeps the eyes from looking like shiny white marbles and simulates a scattering effect. An absorption strenght of .25 allows it to penetrate just enough of the eyeball without overwhelming it. Other textures may not be as white as this one was, so to compensate I add a slight tint to the dark gray in the absorption channel. This work well for extremely white sclera as well. In one example, the eyes needed some blue added to them to kill some of the harsh white. When I am picking an absorption color, I first choose the exact color I want (very pale blue would be something like RGB 225,238,255). Then I create the inverse by subtracting each of these values from 255. So, my resulting color would be (RGB 30,17,0), which I would then put in the absorption channel. The effect is very subtle, but looks nice and won't kill the red veining in the eye. I keep the bump higher than I would for skin because you can lose the effect through all the glossiness and the eyes will look too smooth and perfect. I hope these settings will help you achieve the eyes that you want without having to resort to a geometry shell, which I tried but did not like the extra hassle of creating settings for both the Genesis figure and the shell. Thanks Slosh, im trying these out on V4, what settings to use for the eye surface? Not sure what you meant by "eye surface", but it looks like you figured it out. Looks good. Theres an extra surface on Victoria 4 called "eye surface" this is not on Genesis figures. Oh! Did not realized that. I guess I would just make that completely invisible or give it the same settings as cornea. Yeah I made it the same as the cornea. Just putting some hair on her then I may pop up another test. Im happy with this, hair needs more work but the skin and eyes are good I think. Fantastic! I like the jewelry, too. The hair does indeed need a bit of work, but otherwise awesome. Love her skin, eyes and metals. Really fantastic! Thanks guys, i will post it in the Luxus thread once I finish her hair and find a suitable environment. Thank you so much for this template. Thanks to you I'm starting to figure out how this works (absorption is the OPPOSITE of what you want to end up with, for example). I'm using your settings and by playing with them I'm getting a fuller understanding of how they work. I would have been lost without your set up. I'm glad to hear that this thread is helping you get a grasp of the settings. We have all tried them, changed them, scrapped them, and tried them again. Each person will find the settings that hit the "sweet spot" for them, but at least this is a start. I just wanted to say this thread helped me out tremendously in figuring out exactly how to use Luxus for skin settings. Thank you so much to everyone who contributed, especially to Slosh! I am attaching my first ever render using Luxus and I would appreciate it if anyone has any comments or suggestions. This is a completely un-postworked version, with the "default" film response but an adjustment to the whitepoint setting. This was actually the first image I've dealt with that gave me quite a bit of grief with regards to color space... it looked significantly different to me between the luxrender console and photoshop especially before I adjusted the whitepoint setting. I can detect that same difference if I convert to sRBG or not using "save for web" in photoshop.... so I have a lot more to learn about all that, I guess. My understanding is most browsers should manage that and it should appear like the one using sRGB to most people. First, thanks for contributing to the thread! I am glad that it is still helping people get where they want with the Lux skin settings. I like how the skin came out, overall. The bump seems to be set relatively well, not too much. I'm a bit confused about the texture itself, however. It doesn't seem to me that it lines up properly. This is most noticeable on the stomach, where the hair should be following the center of the abdominals but seems to be going off to the side a bit. Then, in the face around the nose there seems to be some strange misalignment. This looks like the David 5 texture, though I am not positive. Do you have the correct UV's assigned for the texture you used? It's either that, or the bump maps you are using don't seem to match up with the texture. Aside from the previously mentioned, I do like the results you came up with. You didn't overdo it with the absorption rate and colors, it is not overly specular, and the bump is well balanced. Slosh, thanks for the reply and the great feedback, it is much appreciated! The texture is actually from Stolz by Phoenix1966. 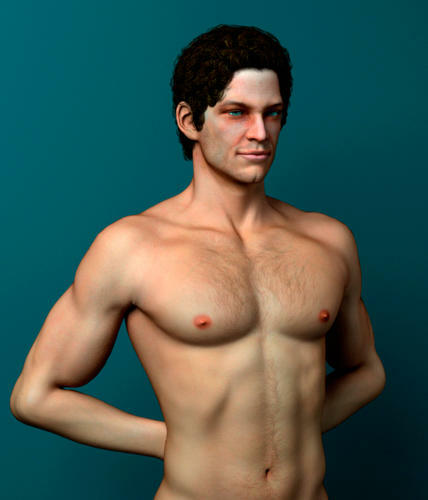 It uses an M4 UV, and I applied it to David 5 with morphs... but I don't think that's the problem with the hair down the abdomen... it appears to be off center intentionally in the texture. I'm a big fan of Phoenix1966's characters and especially their textures, but I never quite noticed that before. As for the face... I think the skin between the eyes and nose is supposed to be kind of red and discolored.. if that is what you're referring to. The bump maps should match up with the texture, but I will maybe check that later. I would like to get a more tanned look, actually, I may have to play with the settings some more to try to achieve that.. my problem was I was coming up with more "red" than "tan" before. As for the eyes, I actually used your settings you shared earlier in this thread for the fairy render.. and didn't mess around with them after that, but I probably need to as all situations are different of course. Ah Luxus settings. I'm only starting to have the time to sit down and really work with LUX. I tried rendering a scene last night, just the environment, and its a large and complex one that I love. Well, something looked odd and it took my mind a moment to realize that everything was coming through bone white. Obviously, all of the bazillions of materials will need to be tweaked, particularly the spec color, so that this doesn't happen and I realize what I'd truly love is a one click solution that alters all relevant settings for everything selected. If I were truly smart I'd figure out how to make that lol instead I just buy someone else's smartness. This led me to wondering how hard it would be for someone to make a few skin presets for figures that LUX-ifies them. I know those 2 notions bundled into one product would get my dollars. Well, I am not sure about your specific case, but make sure that the Tone Mapping Kernal is not set to "autolinear" under the "Imaging" tab in luxrender... that can really screw up everything in the scene because of how it handles lights. If it is, change it to "linear" then adjust the lights and see if you get anywhere... just a thought, I was getting severely "burned" images too until I realized that. Thank you so much for this thread. As a complete n00b to Lux, the Luxus settings are quite confusing. Some of us... yeah, me, don't really understand what most of the sliders do, or grasp what they are for. At least with a base to start from, I can start to understand some of them. Oh its not burned, its stark white and textureless. That's what i get if my spec color is set to white on an object. Unfortunately in the case of the environment I was using, EVERY mat had a white spec >< Ah well, its no biggie. Just takes some tinkering.